A bath toy with Sophie the Giraffe and her friends for baby to play with! 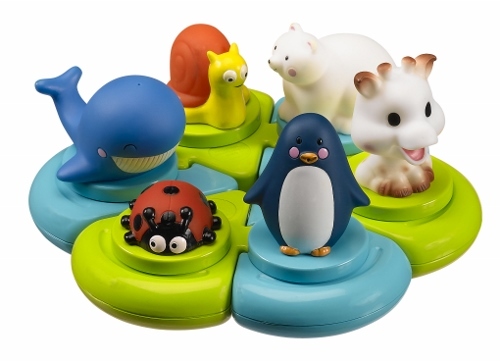 Perfect for developing baby's motor skills, concentration and logic. shapes to be fitted together to become a toy set for baby to play with. funny characters to be fitted onto different shapes. Sophie the Giraffe and all her friends - a penguin, a whale, a snail, a bear and a ladybird. the characters and shapes float on water, making baby's bath time even more fun! they spray out water when their bodies are pressed, and their rounded shape makes them easier to grip.